Before television and movies, long before the Internet, there was magic. The magician Howard Thurston (1869–1936) was known ‘round the world for his colorful and magical extravaganzas. But the performer that people saw on stage in spiffy tails and white tie—serene, collected, completely in control—was very different offstage. Like many people with careers in entertainment, Thurston worked hard to make his public life bigger than life. He was an illusionist, and perhaps his best trick was to make it look as if he really was that calm, well-spoken man of miracles offstage as well as on. His life was no Horatio Alger story. He was a runaway, leaving an abusive father and the family home in Ohio to ride the rails and survive on petty theft and selling newspapers. He was fascinated with magic. 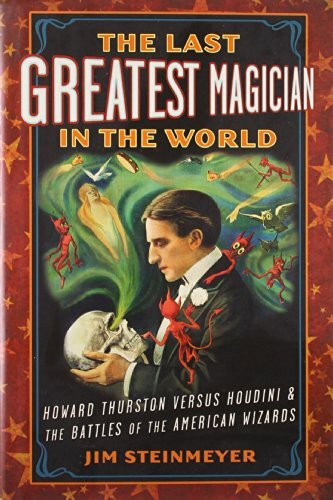 A friend gave him a copy (undoubtedly stolen) of Modern Magic, a definitive text on sleight-of-hand by Professor Louis Hoffman; it was the sole constant in Thurston’s early, always-in-motion, years. He quickly learned to work a deck of cards as well as he could pick a pocket. An arrest for picking pockets in New York City nearly got him sent up the river, but a philanthropic soul on the New York Prison Association helped him get into school instead. Thurston thought about becoming a clergyman—he had the voice for it: deep and mellifluous—but it didn’t take. By his late teens, he knew he wanted to be a magician. He polished his sleight-of-hand while doing tricks on street corners for whatever money he could get, then worked as a “talker” for a sideshow, convincing people to pay to see the show inside. Eventually he wound up at Coney Island, doing magic on-stage as part of another sideshow. That allowed him to earn the money he needed—and the connections—to put together his first magic show (with some financial help from his younger brother Harry). That as the real beginning of his life on the stage. As his fame grew, he never lost touch with his roots on the streets. His early days as a touring magician frequently meant scamming his way out of paying his hotel bill (offering the manager a family heirloom jeweled gold pocket watch—one of many cheap watches he bought by the box-full) and his ability to fast-talk the public was always on call. His skills earned him the approval of reigning master magician Harry Kellar, and Thurston eventually partnered with Kellar and became his successor. Unfortunately, the former con man’s ambition and sleight-of-hand skills were equally matched by his inability to manage money—or to let anyone else manage it for him. As his fame grew, so did his show. New tricks cost money to design, to build and perfect, and to haul from one theater to the next, but that never deterred him from adding them, even as the Depression and the growth of movies as popular entertainment drained theater audiences. Like other magicians of the period, he spent as much time trying to protect his own tricks as he did attempting to buy, beg, or steal other magician’s illusions. It was a cutthroat business, and it took luck as much as skillful maneuvering to get ahead. But get ahead Thurston did: through four marriages, broken friendships, and long rivalries with crowd-pleasers like Harry Houdini. Once Thurston retired, there would never be another like him. Jim Steinmeyer, a scholar of magic and author of several other books on the subject (Hiding the Elephant, Art and Artifice, The Glorious Deception) delivers another entertaining and illuminating look into the history of modern magic as well as the life of one of the 20th century’s most famous practitioners.